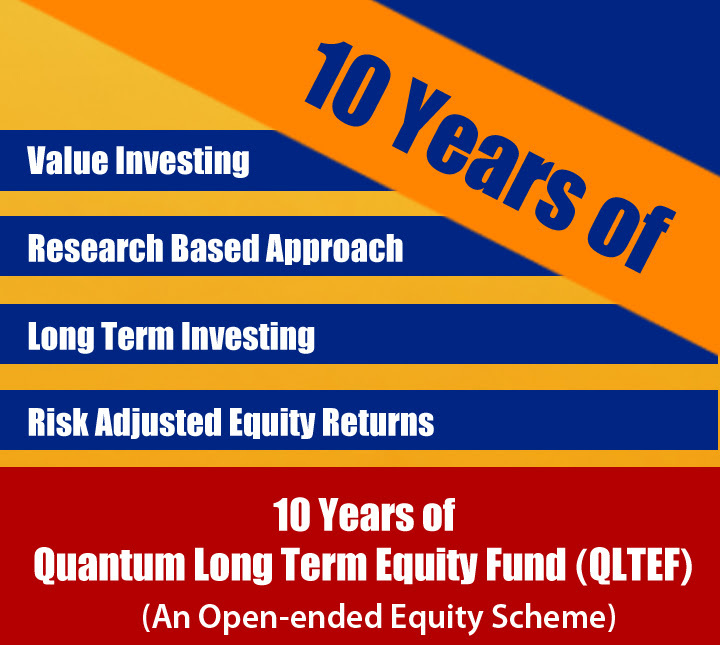 Quantum Long Term equity fund Investment..
^ Past performance may or may not be sustained in the future. Load is not taken into consideration and Returns are for Growth Option. Returns up to 1 year period are Absolute Returns. Returns greater than 1 year period are compounded annualized (CAGR). at shows the current value of Rs. 10,000/- invested at the beginning of a given period. **Date of Inception - March 13, 2006. Since inception returns are calculated on NAV of 10 invested at inception. To view performance of all schemes managed by Fund Manager Mr. Atul Kumar please refer to the Factsheet. market risks, read all scheme related documents carefully. the future performance of the Scheme(s). Quantum Mutual Fund (the Fund) has been constituted as a Trust under the Indian Trusts Act, 1882. Sponsor: Quantum Advisors Private Limited. Trustee: Quantum Trustee Company Private Limited. are incorporated under the Companies Act, 1956. Please visit - www.QuantumMF.com to read Scheme Specific Risk Factors. Investors in the Scheme(s) are not being offered a guaranteed or assured rate of return and there can be no assurance that the scheme's objective will be achieved and the NAV of the scheme(s) may go up or down depending upon the factors and forces affecting securities market. Investment in mutual fund units involves investment risks such as trading volumes, settlement risk, liquidity risk, default risk including possible loss of capital. Past performance of the Sponsor / AMC / Mutual Fund does not indicate the future performance of the Scheme(s). Statutory Details: Quantum Mutual Fund (the Fund) has been constituted as a Trust under the Indian Trusts Act, 1882. Sponsor: Quantum Advisors Private Limited. (liability of Sponsor limited to Rs. 1,00,000/-) Trustee: Quantum Trustee Company Private Limited. Investment Manager: Quantum Asset Management Company Private Limited (AMC). The Sponsor, Trustee and Investment Manager are incorporated under the Companies Act, 1956.